­ Lonza has expanded its mycoplasma detection portfolio with the addition of the Lucetta 2 Luminometer, a single-tube system designed to simplify and accelerate mycoplasma detection in cell cultures. Pharmaceutical, biotechnology and academic researchers can now use this compact, portable and easy-to-use instrument to run Lonza's MycoAlert mycoplasma detection assays and obtain highly reliable results within just 20 minutes. Mycoplasma contamination is one of the most common challenges facing cell-culture laboratories, and it can have a profound impact on cell integrity. However, some of the most widely used mycoplasma detection methods have been associated with time and quality inefficiencies. For example, the agar-and-broth procedure, although highly accurate, takes at least four weeks to complete, while the polymerase chain reaction method requires several hours with an increased likelihood for false positives and negatives. Dr. Claudia Schwartz, at Lonza says: "This small, lightweight instrument can be readily and directly integrated into standard cell-culture workflows without causing any interruptions. It offers highly sensitive and linear measurements of active mycoplasma enzymes in a fraction of the time needed for other techniques and with minimal effort. 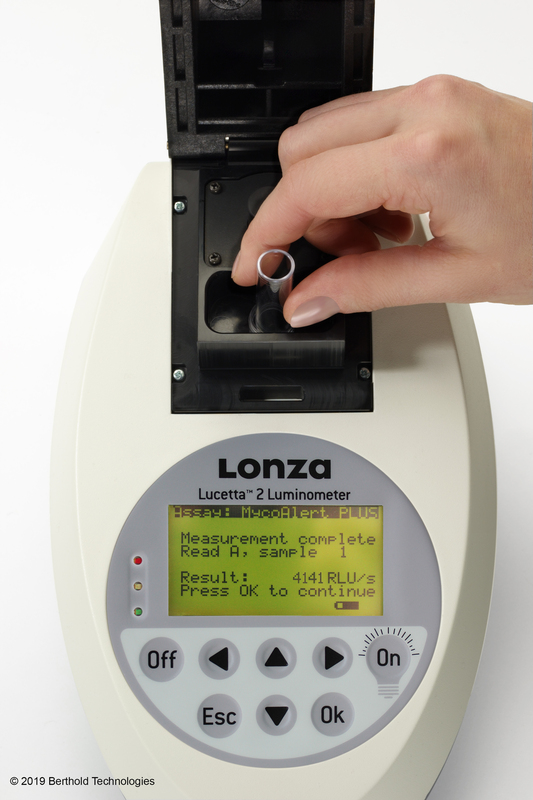 What's more, the Lucetta2 Luminometer comes at an affordable price, making it suitable for laboratories of all sizes."